PATRYCJA DOŁOWY: Congratulations on this important award, which is a sign of recognition by the Polish academic community. 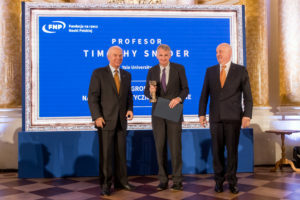 You received the prize for research on the first half of the 20th century, which provided a new dimension to the history of Central & Eastern Europe—throwing new light on the political and social mechanisms that led to national conflicts and genocide. For me, the key to your books is the change in perspective, particular departing from the national perspective. What really makes your approach special? 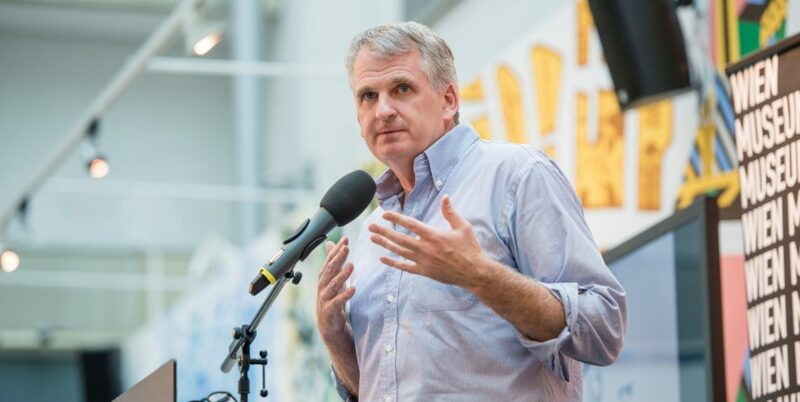 TIMOTHY SNYDER: It’s hard for me to answer that question. That judgment belongs to others. History is a method of posing questions and answering them. It is also a narrative, a path for conveying what is understood. In the case of each of my books, I approached the narratives contained in them somewhat differently. It seems to me that this should also be the fundamental work of a historian—each book should be different, not only in the choice of topic, but also the research method. A historian who approaches history in only one way, applying one perspective, can’t really be a good historian. For me, what is very important is first what must lie at the foundations of the craft of any historian: a capacity for reflection, not writing about yourself, not writing about what is closest to us without stepping back—something that forces us to adopt a new and indeed alien perspective. In my view, national history is not possible without the perspectives of other nations. You may have the intention of writing a work of national history, but it won’t be a good book of history if you don’t take into account other, previously unfamiliar perspectives. For example, it is very hard to write Polish history without the perspective of the other minority languages that were used in these lands. I think that the answers to the questions we pose as researchers should be different from what we expect. Obviously, as I mentioned, history is a narrative, but first and foremost it is a science. And it is not the case in any science that you know the results in advance. The expectation that researchers know the results in advance, in relation for example to physicists or biologists, would be ridiculous and absurd. It’s the same with historians. A historian is not in a position to say anything interesting, anything worthy of attention, if he has not examined it himself. And if he says he examined it, but obtained exactly what he expected, that means that he didn’t really examine it. Even more, it usually turns out that the research queries we pose at the beginning are not the right questions. During the course of research it is often necessary to modify the questions. I am speaking from my own experience. With the exception of Bloodlands, each of my books turned out different than I expected. Not only in terms of the results, but also the research queries themselves, which I had to revise along the way. In Bloodlands you not only shift the perspective toward Central & Eastern Europe, but abandon the national perspectives in describing the crimes of genocide. This is an unusual approach to European history in general. Did you choose this approach from the beginning? From a historical point of view, the histories of Poland, Belarus and Ukraine contain answers to the most important questions concerning the history of Europe in general. Bloodlands is the story of two terrors: Stalinist and Nazi. The subjects themselves are known to every Western European historian, and no doubt some regard them as exhausted. But in my view, we weren’t really in a position to write anything worthwhile on these topics without the Polish, Ukrainian, Belarusian, Russian and Jewish sources. Bloodlands is the only book of mine for which I didn’t change the research queries during the work. I understood that the Holocaust and the Great Famine in the Ukraine (Holodomor) are among the most important topics when we analyze that period. I decided to pose questions different from those posed before: Why in those lands, and not elsewhere, were a total of 14 million people killed for political reasons. I decided to treat all the horrible genocides carried out here within a brief period as one event—and only later, on this foundation, to rewrite the history of the Soviet Union or Nazi Germany. The topic of Poland is not provincial, quite the opposite. The Polish perspective is essential to understand what emerges beyond the borders of Poland. When saying that the Polish perspective is necessary, I don’t mean that it must be added to the Jewish or Ukrainian perspective. Rather, these events need to be covered by a methodology that can reflect the Polish reality but also contain it within other realities. Rejection of the national perspective doesn’t mean that the historian will add one historiography to another. It is necessary to understand the given historiography also from within. But this in insufficient, as it is important to ask questions that are key for the nation but cannot be answered within the framework of national history. In Bloodlands I addressed the territory where people were murdered—not national borders, which altered in any event during occupation, and not the states, because the states were destroyed. The framework for national history or state history is insufficient. So I began differently—from spaces, and on the other hand from human experiences. With these assumptions, I ultimately reached new conclusions and new interpretations. You continue this line in Black Earth. Boundaries are not important to you. You write about general mechanisms that affected this part of Europe. I originally had no intention to write this book. In a sense, it is a response to the previous one. When writing Bloodlands, I realized that how we historians think and speak of the Holocaust is largely false. We quickly drew theoretical conclusions without fundamental, concrete knowledge of what happened. I examined the field of Holocaust studies and it seems to me that researchers focus on questions of “memory,” while the fundamental question is, Memory of what? A historian is not interested primarily in how people remember, but what they remember. A historian cannot study memory without knowing, or without trying to determine, how it really was. And that is not simple. What is the difference between human memory and historical reality? There are not enough specifics in questions about the Holocaust. For example, there are commonly known facts, but some of them have never been described on the basis of historical methodology, not to mention statistically legible data. There are few theoretical conclusions in Bloodlands. There I wanted first and foremost to show how it was, applying time frames and individual frames to those events. But in the next book, based on this empirical reality, I wanted to attempt a historical argument—to describe how it came about. To add my own interpretation. After writing Bloodlands I spent nearly two years on lectures and debates about the book. I was constantly having to answer questions about the causes. A new interpretation began to form within me under the influence of these discussions. Arguments about the ecological crisis and destruction of the state are present in the first book, but only marginally. I tried to formulate my thoughts about statelessness, destruction of the state, in a few articles. This proved impossible, however, because what I wanted to say was so radically different from the existing theories that it required thorough work and filling in all the gaps that appeared. Writing that book became a long, hard process. How do readers make out the warning in the title of the book, Black Earth: The Holocaust as History and Warning? In Black Earth I write about how Poland was during the Holocaust. I was not interested in the behaviour of Poles as such, even if I have my observations. I was interested in the behaviour of people, also as manifested under specific conditions. I have data on how different Poles behaved at the time of the Holocaust, but I didn’t find in these analyses anything indicating that they behaved in any way differently than others. That leads me to one of the main conclusions of the book, which is uncomfortable both for Poles trying to create some national narratives, and for people who want to criticize Poles as a nation. The argument in this book concerns many people who found themselves then under German or Soviet occupation. I base this conclusion on human behaviour: not Polish, Ukrainian or Belarusian. It seems to me that such argumentation is much more persuasive than national argumentation. There are those who want to hear that Poles or Ukrainians behaved better or worse toward others, but it turns out that the analysis of this issue in terms of ethnicity provides no results in research terms. The behaviour of people can be explained by political conditions. For scholarship this is no surprise. The very discussion of the Holocaust, the Second World War, the 1930s and 1940s, is so highly politicized that my argument may seem strange. People want a given group to be worse or better, and not human. Have Poles responded in some particular way to your books? There are at least three types of reactions to them by Poles. First I hear, “We Poles already know all of this, but you are our spokesman, because you explain it professionally.” I’m not particularly fond of that view. It seems to me that Poles nonetheless don’t know everything. The second variant goes like this: “We are grateful to you for formulating Polish history in a way that both we and the West can understand it.” In the third version, Poles say, “It’s great that you stress what our suffering was like.” What is missing is an understanding that Poland is not the only topic of my books. However, I have never had anyone complain about my approach, except for a few Holocaust researchers who are interested solely in the Jewish perspective, the perspective of the victims, and regard it as the only possible one. According to that approach, the Holocaust is unique and exceptional and cannot be compared with any other genocides. But this is logically impossible. Jews who were murdered, as well as those who miraculously survived, had their experiences with various systems. The very prism of the Holocaust is our contemporary analytical perspective, and not that of the people who lived at that time. I think that as with all historical events, if we want to write about the Holocaust, we must realize that it has incredibly many different aspects. In addition, we have numerous sources available, in different languages. But such reactions are not frequent. On the other hand, there is a large group of American Jews who regard Bloodlands as a book about the Holocaust. Meanwhile, in Ukraine, they treat it as a book about Holodomor, and in Poland many people read it as a book about Katyn. Is there anything wrong with that? In a natural way, some topics interest people more than others, but the very fact that the book can be read from different perspectives is important to me. I also think so. I believe that people in this region very much need a new perception, because the identity one carries, the identity of a victim, a perpetrator, a passive witness, is very hard for everyone—Poles, Ukrainians, Belarusians, Jews. But I wonder whether such an approach, that people behave one way and not another under certain political conditions, strips them somewhat of their responsibility? That certainly wasn’t my intention. Rather the opposite. It seems to me that the problem with every national narrative is precisely that it takes away people’s sense of responsibility. This is a fundamental problem of national historiography. There are temptations for such historiography to become a collective memory, where the boundary is not clearly established. In my view, a historian should strive to ensure that this boundary is established as clearly as possible. A historian who wants to show how well Americans, Poles or Lithuanians behaved during the war is not a true historian. If we stipulate that the nation is, firstly, one set, and secondly, that it can be innocent, if we combine these two things in our heads—one set and innocence—then it becomes very hard to think at all in terms of individual responsibility, and particularly with respect to dangerous, unforeseeable events, which certainly have happened, are happening now, and will happen in the future. In short, my intention was the opposite, not only in Black Earth, but also in Bloodlands, where I write that it is more important to identify with the perpetrator than with the victim. The point is that we should be in a position to understand the experience of specific people, both the perpetrators and those who in some way, perhaps not directly, contributed to their neighbours being murdered. It is precisely through understanding that we will be in a position to be more reflective, not only towards our own nation, but first and foremost towards ourselves, as citizens and simply as individual people. If we think incorrectly of the past, we are in danger of being blind and unprepared for the challenges of the future. In Black Earth I wanted the Holocaust to become the most living history possible. It should be understood that when the state was destroyed, people behaved differently than when the state functioned. Neither this situation nor the dangers flowing from it have ceased to be relevant. Unfortunately states continue to be destroyed, weakened. The history of the Holocaust and the genocides of the 1930s and 1940s must remain alive so we can grasp the challenges facing us today. In my view, history is always a warning. Not only the history of the Holocaust. When we speak of memory, it seems to us that we know everything and that we were on the right side. If that is the case, if that is how we regard it, that is morally unacceptable. So what conclusion do you think we can draw today? We, meaning who? People? The first lesson is that we must be aware that democracy is fragile and the rule of law is fragile. Democracy and the rule of law are not given once and for all, and they don’t defend themselves. They are created by people, and people can destroy them. To that lesson I would add a second lesson that flows from Black Earth: Even an authoritarian state is better than none. Statelessness is the most dangerous. Destruction of the state has the worst consequences. The danger appears when an authoritarian state attempts to destroy neighbouring states. That’s what happened in the Second World War. We have similar experiences today, e.g. in Iraq or Ukraine, where one state destroys or attempts to destroy another. This is a good example of how the Polish experience appears unique to Poles. The Polish state was destroyed, much like the Lithuanian, Estonian and Ukrainian states. These are common human experiences and should be considered in that light. In Black Earth I wrote about science and technology, but the third fundamental lesson, in my view, concerns time. Democracy and the rule of law require that citizens have a sense that they have time, that there is some kind of future that is not a catastrophe. This is essential. In both Stalin’s Soviet Union and Hitler’s Germany, it was known that the future would be cruel, so something radical had to be done now. Why do I use this analogy? Today we face the risk of ecological catastrophe, and the longer we do nothing, the more likely the scenario becomes in which an authoritarian, totalitarian, or aspiring authoritarian politician says, “It’s a catastrophe, there’s nothing we can do, so we must act politically—start a war.” In the United States we know that people are arriving from the south and will continue to do so, because of climate change, while at the same time we have a president who denies the fact of climate change and at the same time builds his career on inflating the sense of threat from migrants. It’s similar in Europe, not only in Poland. Right-wing politicians don’t say, “It’s a problem, we must take long-range action on the climate,” but instead, “There’s a problem with refugees.” If we act so that catastrophe is more and more likely, democracy will be less and less likely. I’m interested in how you happened to take up Central & Eastern Europe in particular. Apart from purely scholarly motives, obviously? I have no roots here, but I wouldn’t say it was an accident. For me Poland and the neighbouring countries are tangible, concrete, and describable thanks to knowledge of their languages and literature. Also thanks to people. They often ask me in Poland how I feel as an outsider. But I don’t feel like an outsider. Of course I am not “from here,” but I don’t look at Poland as a foreign country. I look at it with various emotions, thanks to knowledge of the culture and friendships. Back in the 1980s, when I was a student, I thought that Central & Eastern Europe was an unusually interesting region. From my American point of view at that time—forgotten, and a little exotic, because it wasn’t Russian. In America the Soviet Union was perceived as Russia, and the other countries of the region were not really noticed. But at the end of the Cold War, it was Poland in particular and other countries that became visible, thanks to Solidarity and later the revolutions of 1989. I was lucky to have professors at university who studied the history of Central & Eastern Europe. When I received a scholarship to England, it was obvious to me that I would use it to study languages and travel to the east. I already understood that it was essential to be able to access sources in their original languages. Thanks, I must say, to George Soros, at Oxford I met Poles and Czechs, Hungarians and Slovaks. Friendship and knowledge of Polish (it was my first Slavic language) allowed me to travel around Poland. Thus my path led via Oxford to Poland, and from Poland to other Eastern European countries. For me it was a huge intellectual adventure. I still feel that thanks to the language, sources, and Polish colleagues, I am in a position to study things that are fresh, interesting, unexpected. Polish, Lithuanian, Ukrainian, Belarusian, Russian, Yiddish—languages give you access to individual and emotional perspectives missing in the mainstream narrative, because the language of the mainstream narrative cuts them off. Certainly language helps us grow. I’m not a Pole and never will be, but the fact that I spend a lot of time speaking and reading Polish changes me and instils, if not always sympathy, at least the possibility of sympathy to Poles, sensitizes me to numerous topics. The simple example of interwar Poland, which there is a lot of discussion of now due to the anniversary of independence—interwar Poland looks different in Ukrainian than in Polish, different in Yiddish than in Polish. In history, thanks to a minority language you can find a trail that is not visible without a knowledge of that language. Sometimes it is even important to examine in the original the literature that for example a given politician read. Language can prove important in non-obvious and unexpected ways.